Among over 50 presentations, AIMTEC’s research was awarded the best qualitative paper for its multidisciplinary discussion on the innovative responses of its Bridging Leadership fellows to the societal complexities of diverse societies in Asia. Bali, Indonesia – Stakeholder analysis and identification research conducted by the Asian Institute of Management’s TeaM Energy Center (AIMTEC) for Bridging Leadership (BL) was presented at a parallel session focused on social issues on leadership at the Second Biennial Lead in Asia Conference last 5 July 2018. Among over 50 presentations, AIMTEC’s research was awarded the best qualitative paper for integrating different disciplines in its discussion of the innovative responses of leaders who participated in its flagship fellowship programs and overcame collaborative challenges of leading societal change amidst the complex contexts found at diverse societies in Asia. Assistant Professor Manuel J. De Vera, AIMTEC’s Executive Director, presented the multiple case study research which sought to understand how leaders from government, non-government, and military sectors analyzed and identified stakeholders to form successful core groups and guiding coalitions for their societal change initiatives in the varying contexts found in Mindanao, Philippines. Prof. Manuel J. 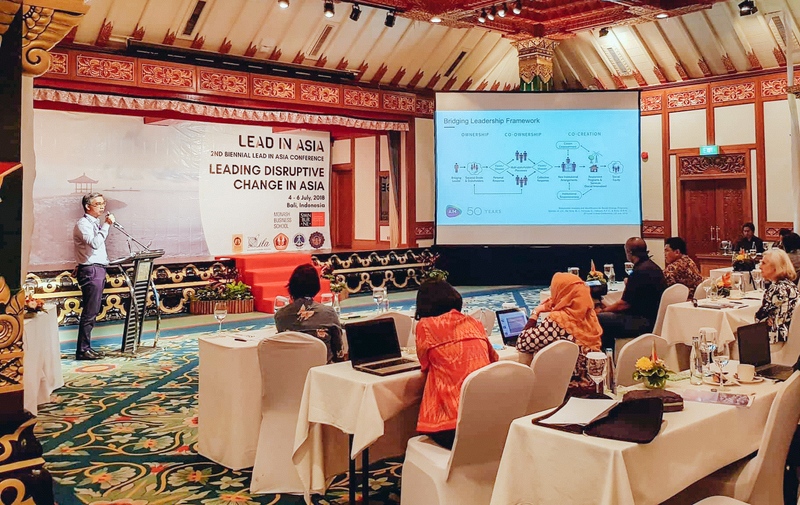 De Vera, Executive Director of AIM TeaM Energy Center for Bridging Leadership, presented the Stakeholder Analysis and Identification research to members and partners of the International Leadership Association (ILA) at a parallel session focused on social issues on leadership at the second Biennial Lead in Asia Conference last 5 July 2018. Professor De Vera discussed key limitations of common stakeholder analysis and identification approaches used across disciplines and presented a wider process framework for managing stakeholders based on initial findings from AIMTEC’s five-year (2016 to 2021) research agenda. He shared crucial insights gained from the research that highlighted the growing need for leaders in and beyond Asia to be mindful of the more indigenous, iterative, and dynamic interplay between formal and informal approaches to stakeholder analysis and identification, especially when responding to the challenges of reaching settlements in complex and fragile environments. With this recognition, the research team, composed of former AIM Professor and AIMTEC co-founder Jacinto C. Gavino Jr., Managing Director of US-based development management consulting firm Change Interventions for Development (CID) Dr. Cecilia C. Verzosa, and AIMTEC development researchers Karmela Faustine C. Indoyon and Maria Raizza Renella P. Bello, acknowledged the generous support of longstanding AIM partner and AIMTEC’s endower TeaM Energy Foundation, Inc. (TEFI) and its mother company TeaM Energy Corporation (TEC). The Second Lead in Asia Conference gathered members and partners of the International Leadership Association (ILA). It was hosted by Australia’s Monash University’s business school and centered on leading disruptive change in Asia. A special publication of selected papers from the conference is now being produced.